Help save Man on Bench for Bruton! Man on Bench has been on loan to the Town Council for the past two years through the generosity of his maker Giles Penny. 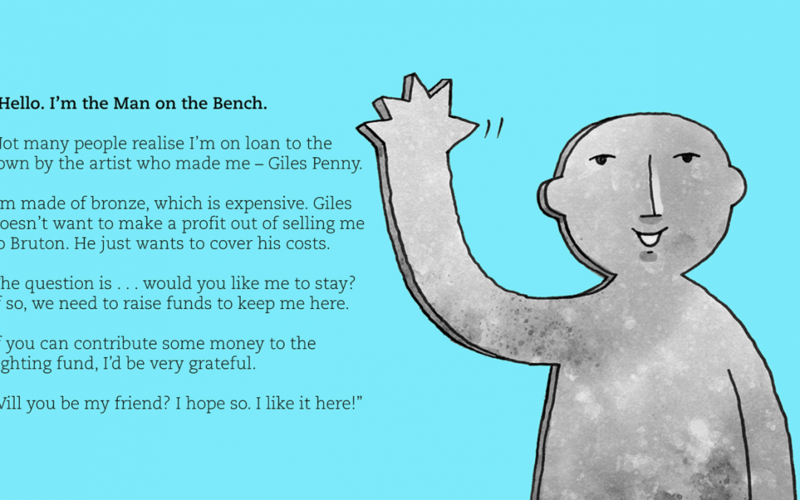 Giles needs to cover his costs, so if Man on Bench is to stay the town now urgently needs to raise the funds to keep him. The Town Council does not have the legal power to purchase works of art (though it may own them). We are exploring other avenues (such as grants) to raise some of the money, but we also need your help if Man on Bench is to stay. We have set a target of £12,500 to be raised by 15 October 2017. If you want to help please go to the Crowdfunding page. You will not have to pay unless the target is reached.